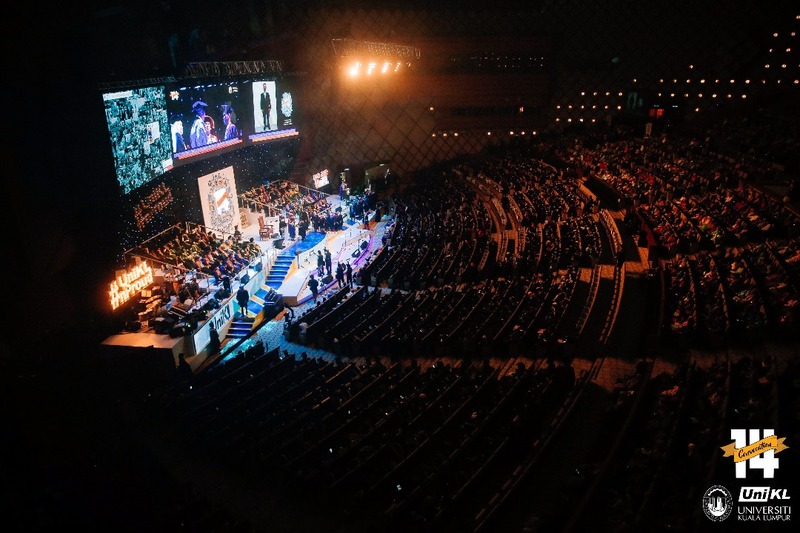 PUTRAJAYA, 22 October 2017 – Universiti Kuala Lumpur celebrated a total of 8,100 graduates in its 14th Convocation Ceremony held at Putrajaya International Convention Centre, PICC. The ceremony was graced by His Royal Highness The Regent of Pahang Tengku Abdullah Al-Haj Ibni Sultan Haji Ahmad Shah Al-Musta’in Billah, the Chancellor of UniKL. The graduates received their scrolls in PhD, Master’s Degree, Bachelor’s Degree, Diploma and Professional Certificate. Also present at the ceremony were Dato’ Dr. Awang Adek Hussin, Chairman of MARA and Dato’ Azhar Abdul Manaf, Director General of MARA, both are newly appointed Pro Chancellors of UniKL. Joining them were YB Dato’ Sri. Dr. Adham Baba, Chairman of UniKL and Prof. Dato’ Dr. Mazliham Mohd Su’ud, President/CEO of UniKL. The ceremony also witnessed the conferment of Honorary Doctor in Management to Dr. Arthit Ourairat, President of Rangsit University who is also a member of Thai Parliament, Datuk Dr. Yoshiko Nakano, President of OISCA International and Dato’ Sri Ibrahim Ahmad, former Director General of MARA and Pro Chancellor of UniKL. A total of 28 best students also received their awards conferred by HRH The Regent of Pahang. The 2017 Chancellors Award, the highest recognition of a student’s achievement was awarded to Naim bin Nasir from UniKL Malaysian Institute of Aviation Technology (UniKL MIAT), Bachelor of Aircraft Engineering Technology (Hons) in Mechanical. The two Council Award recipients were Ahmad Zainul Abidin of Bachelors of Engineering Technology in Industrial Automation and Robotics Technology, UniKL Malaysia France Institute and Pavitra Sivalinggam of Bachelor of Pharmacy, UniKL Royal College of Medicine Perak. HRH Tengku Abdullah in his royal address to the graduates expressed his concern at the young generations for their shallow understanding, lack of interest and knowledge pertaining the Royal Institution. His said, ” There are those who do not appreciate the role of the Royal Institution and feel it is no longer relevant in the modern era. The royal institution is not merely a symbol of the customs and continuity of history, what is uppermost is in maintaining the identity of the nation state, to always protect the people so that the glory and sovereignty of the nation remains preserved,” he proclaimed. 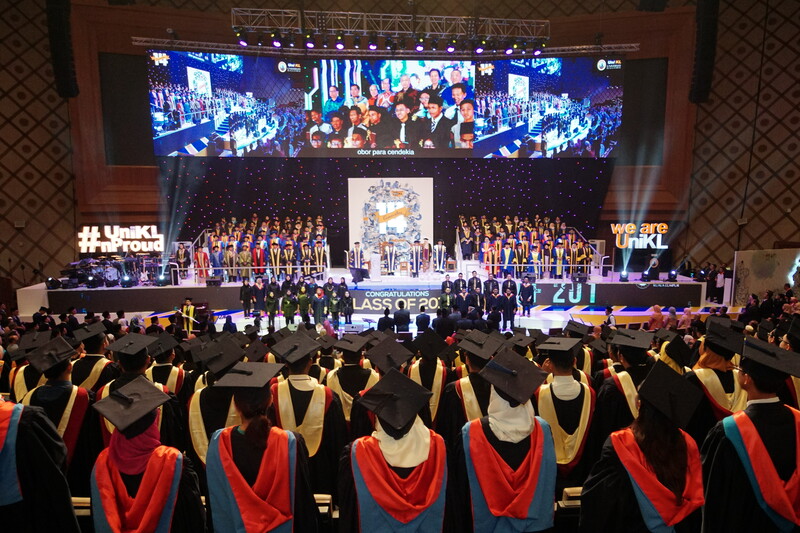 What is becoming synonymous to UniKL’s Convocation ceremony, graduating students were entertained by top class artistes and performances by UniKL’s choir team, UniKL Voice. Graduates and parents were entertained by A-Class artistes among others JJ, Dato’ Awie, Dato’ Nash, Wani Hasrita, Hail Husaini, Harry Khalifah and many more. A carnival like atmosphere complete with cultural performances, choir performances, exhibitions and sales booth, all led by UniKL students and staffs greeted visitors and family members of UniKL’s 14th Convocation Ceremony.